What could be better than brownies? Or cheesecake? 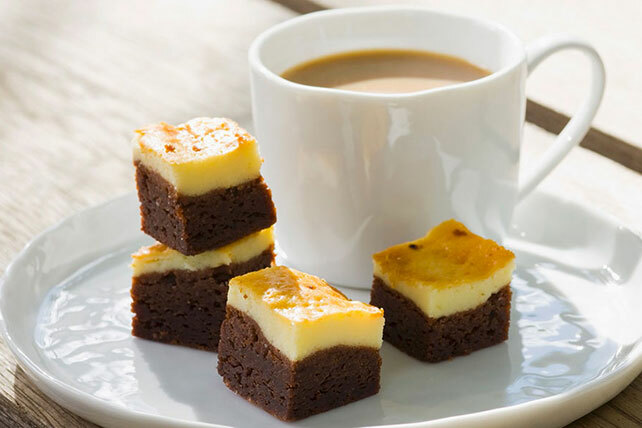 Cheesecake and brownies together! This dessert is simple to put together and delicious. The best of both worlds! Line 8x8-inch pan with parchment, with ends extending over sides. Microwave chocolate and butter in large microwaveable bowl on HIGH 2 min. or until butter is melted. Stir until chocolate is completely melted and smooth. Whisk in 2 eggs, 1/2 cup sugar, 1/2 tsp. vanilla and flour until blended. Spread onto bottom of pan. Set aside. Beat cream cheese and remaining sugar until well blended. Add remaining egg and vanilla; mix well. Spoon evenly over brownie batter. Bake for 35 to 40 min. until set and toothpick comes out with fudgy crumbs. Try this recipe with 1/2 cup chopped toasted walnuts stirred into brownie batter. Swirl 1/4 cup raspberry jam into cheesecake layer before baking.